Peer through the die-cut windows in each page of this interactive book to find out who is playing what. 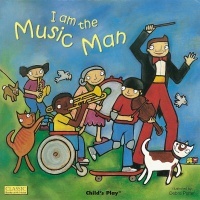 Anyone can be the Music Man in this joyful adaptation of the classic nursery song, and everyone can join in making music together! All children love this traditional rhyme and singing along will help to develop number skills. Bouncy illustrations, innovative die cutting and popular rhymes make Books with Holes a must for every child. Available in three formats, suitable for babies, toddlers, pre-schoolers and the nursery or classroom.